Ladies First will have one further throw of the dice in Melbourne before returning home to be set to defend her Gr.1 Auckland Cup (3200m) crown. The six-year-old daughter of Dylan Thomas finished eighth in the Gr.2 Moonee Valley Gold Cup (2500m) at Moonee Valley on Saturday, just under six lengths from the winner, Ventura Storm, when ridden by Michael Walker. “Mickey intimated the track circumference didn’t suit her and also a bit of rain would have helped her,” trainer Allan Sharrock said. “They ran a track record and it was the best Moonee Valley Cup field for years. They usually get eight or nine runners but it was a full field this time. Sharrock plans to back Ladies First up in the Gr.3 Hotham Handicap (2500m) at Flemington this weekend. “Hopefully it won’t be as hot a field and it’s at Flemington which will suit her better,” he said. “I’m not sure who will ride her as Mickey can’t. Ladies First had five starts from last December in her build-up to last season’s Auckland Cup, but, having had a spring campaign and the Melbourne trip, she won’t need as much of a summer race build-up this time after her freshen-up to have her tuned for the Ellerslie feature on March 9. Sharrock also plans to back up Art Deco this weekend, in the open 7 f sprint at Awapuni. 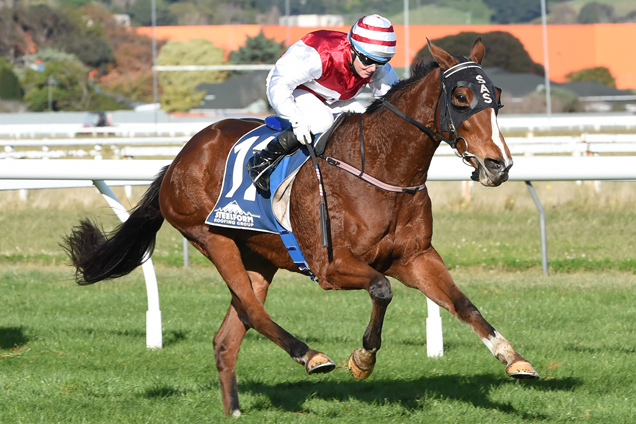 Art Deco followed up a couple of Group Three placings with a sixth in Saturday’s Gr.3 Thompson Handicap (1600m) in the hands of stable apprentice Wiremu Pinn. “It wasn’t a good ride by the kid,” Sharrock said. “Sitting three-wide in the open made it too tough for her. Sharrock also had no joy with London Express in Saturday’s Gr.3 Partners Life Soliloquy Stakes (1400m) at Ellerslie with the Shamexpress filly giving the winner Media Sensation too much of a start on the home turn and winding up late for fifth.